The legendary Mont St Michel castle in France was for years on the short list of places I wanted to visit. Rising dramatically from the sea it’s an abbey, city and an island in one. It’s actually a tidal island which means it’s only an island during the high tide – feature that brought fame to this place. 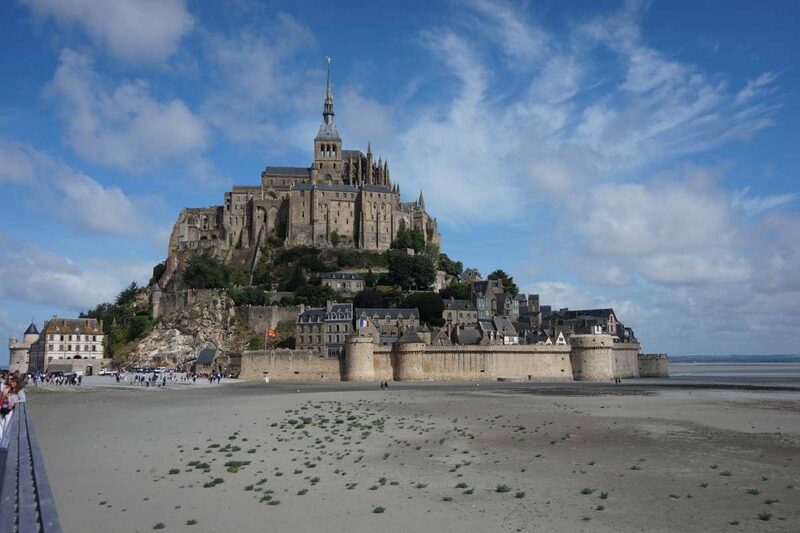 Due to this phenomenon, Mont Saint Michel became a site for religious worship and in the end also a castle. 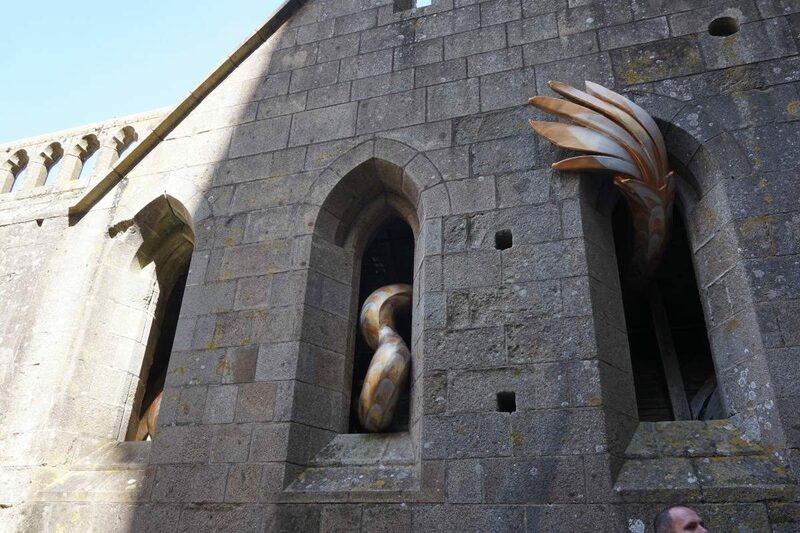 Each visitor heading to Mont St Michel has different expectations. Some want to see it as it’s something completely different than anything else in the world. Other got inspired by the Disney movie Tangled, as this castle was an inspiration for the royal castle of Corona. Or some simply want to see every UNESCO heritage sites on the planet. Regardless of the reason that brought you to Mont St Michel you have some expectations about it. And so did I. After visiting the castle I realized that my expectations about this place were completely different from reality. 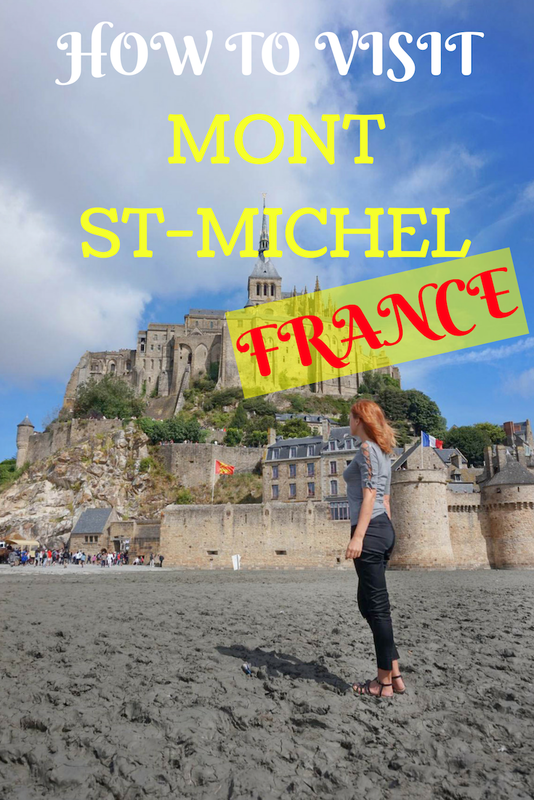 Did Mont St Michel disappoint me? Not at all. In fact, it impressed me even more than I thought I would be. But there were many things that surprised me. I was also extremely lucky to visit this gorgeous place with Sara from Normandy Melody Tour Company. Normandy Melody provides small group or private tours from Paris or Port of Le Havre (where cruises stop). So you’re not actually on a giant tour bus full of people, as it was just me and another couple. It felt like I was having a private, very knowledgeable and funny tour guide, available to answer all my questions. I did two tours with her (another one to Auvers Sur Oise) and both times the experience couldn’t have been better. I highly recommend Sara and I think without her I’d not have had such a great experience. Mont St Michel is a UNESCO World Heritage Site since 1979, also classified as a monument in 1874. Saint Michel population is only less than 50 people. The monastery was also a prison at some point. The Abbey/Castle receives over 3 million tourists every year, making it one of the most popular site in France. The structure of town represents the feudal society in the Middle Ages. On top is the abbey and monastery – representing God, right below the great halls with stores and houses, and at the bottom houses of fishermen and farmers. St Michel has a long and complicated past and your guide can tell you more than me, but here’s a brief history. Until the 7th century, the place was actually called Mont Tombe and belonged to the Diocese of the Avranches. 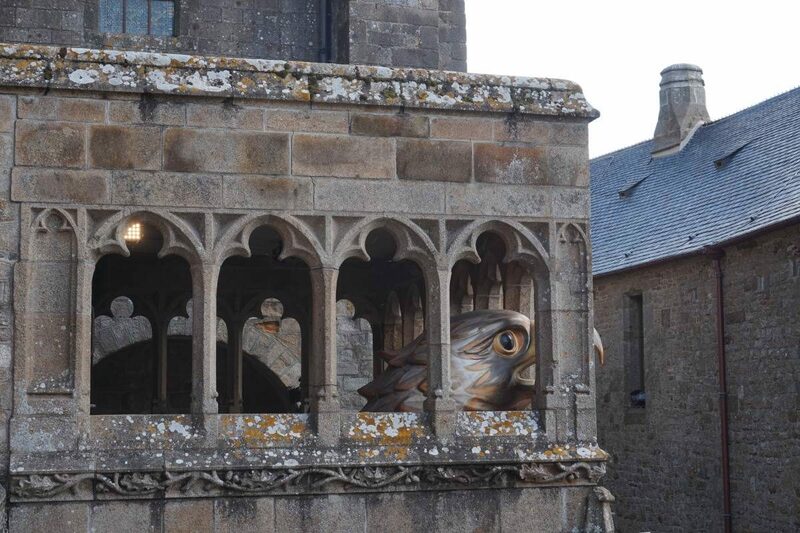 Local legend says that the bishop of Avranches, Saint Aubert, had a dream in which the patron of a sailor – Saint Michael, told him to build a church on top of the Mont Tombe. However, since he ignored the dream a few times Saint Michel bore a hole into his skull what made him do it. The legend didn’t come from anything as the real skull kept in Saint-Gervais Basilica presents the hole in it. But the science claims it’s due to trepanation. Who knows. Once the church was built it’s been captured by the Vikings what made the monks move away. But in 966 the Duke of Normandy allowed the Benedict Monks to settle there and add a pre-Romanesque church of the abbey. But it’s not the end of the story. ‘The 100 Years’ War commenced with the Duke of Brittany leading the siege to Mont Saint Michel what caused it to hold out for 30 years! The Duke massacred the village but didn’t conquer the fortified abbey what made it a fortress. The King of France also ordered reparations for the damage and gave a grant for the construction of a new Gothic cloister and refectory. In the 17th century, the abbey was closed down and changed into a prison that lasted until 1863. In 1874 the places became a historical monument. Getting to Mont St Michel from Paris takes a long time, as it’s 155 miles away. My trip started at 6:30 am and by the time we got to St Michel it was already full of people. I saw a lot of photos of Mont St Michel before, with either water surrounding it, or sheep eating some green grass in the foreground. However, I didn’t experience any of the above! Instead, I saw a lot of mud, but it was still beautiful. If the mud is dry enough you can get a tour that allows you to walk around the island. Unfortunately, you can’t do this part on your own as it gets fatally dangerous with the tides. After we entered the village, I followed the Grand Rue. It’s the main street of this city and a shopping paradise. If you like the Dragon Alley from Harry Potter you’d fall in love with this place! The streets were narrowed and Gran Degre stairs were steep, but we proceeded straight into the Abbey first. As I visited this place in August the place was extremely crowded. A line to enter the abbey was starting at the bottom, what scared me at first – I thought we’d be standing in this line for hours. I imagined how horrifying the crowds must be inside the actual abbey, but I got positively surprised. Thankfully, thanks for Normandy Melody again, I had a skip the line ticket. It allowed me to walk in and pass all the crowds without the wait. The regular entrance ticket might cost you only 9 Euros, but you’ll stay in line for a few hours to get in, so in my opinion, it’s definitely worth to get the skip the line ticket as inside the abbey there were barely any people! I was able to catch great views of the town below and see the countryside of Normandy. I was told that if you’re lucky, during the high tight you can even spot some seals! The church, added after the Hundred Years War was nothing extremely special. But again, I might be biased as an art and cultural historian I saw and examined a lot of churches in my life. The abbey’s cloister was probably my favorite. 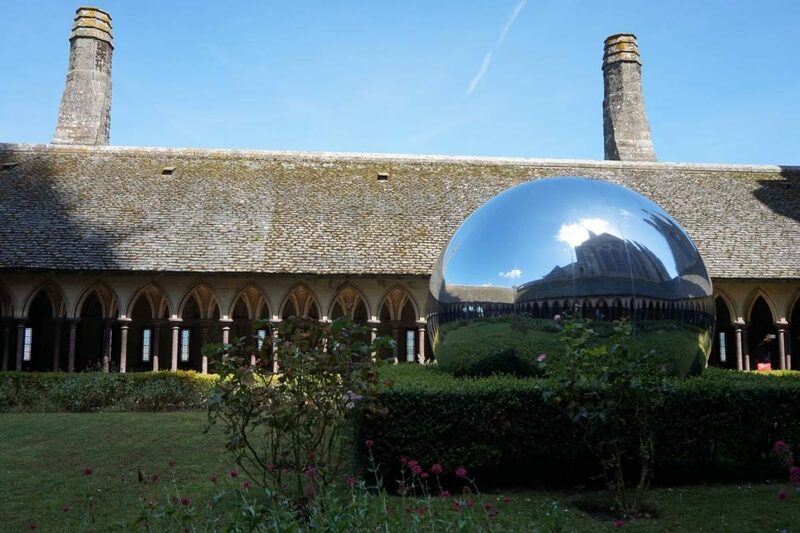 It was designed as a gathering spot for meditation or ceremonies, as well as way to connect the various sections of the abbey. But the best part of the modern addition to it, a giant glass ball allowing everyone to see the whole thing. 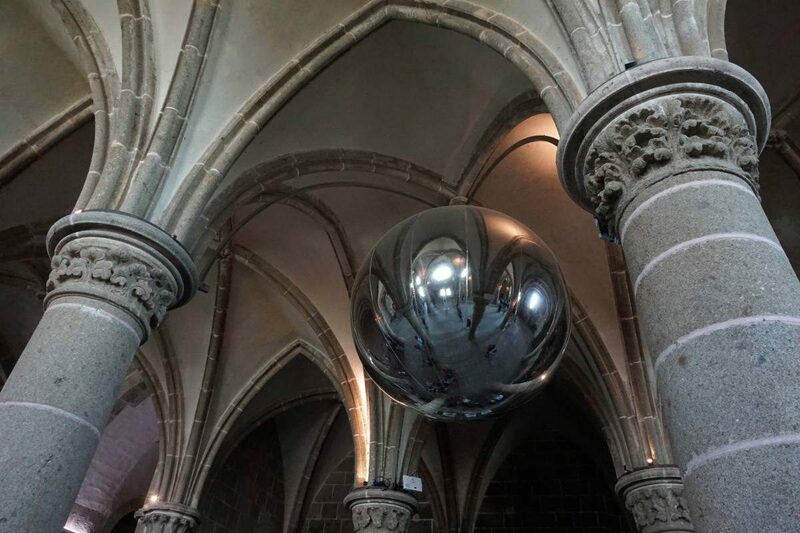 The same ball was hanging from the ceiling of the Guest Hall. Knight’s Hall was another interesting place, as it was actually never used for knights. Monks built it in order to host Knights and the King, but no one ever came, so they ended up using the room as a place to study instead. The final place I visited was the crypt used as a prison. There are loads and loads of ‘tourist traps’ inside the medieval village, all of them wanting your money. If you’re looking for souvenirs you should probably buy them anywhere but there, as it’s quite overpriced. Same goes for restaurants, so do look at the menu and prices before getting in. The most well-known restaurant in Mont St Michel is Le Mere Poulard. Annette Poulard created this place back in the 1870s where she made her giant souffle omelets famous. People from all over the world used to make their journey just for these omelets, including statesmen, dukes, kings & queens, musicians, and actors. There are currently two Le Mere Poulard – the main restaurant and Le Mere Poulard Cafe with a simplified menu. The second one is more affordable and has a better view. I actually decided to try a traditionally baked cheese salad from Normandy which for a cheese lover like me it was a dream! If you want to extend your trip and spend a night, I wouldn’t recommend staying in the actual Saint Michel. 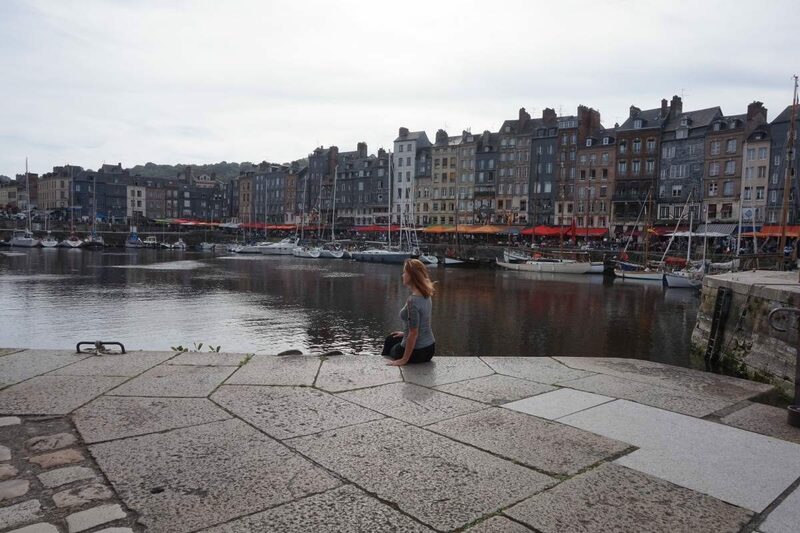 There are just a small handful of accommodation options there and they’re extremely pricey, so most visitors head to nearby Saint-Malo. It’s technically in Brittany, not in Normandy, but it’s only an hour away. 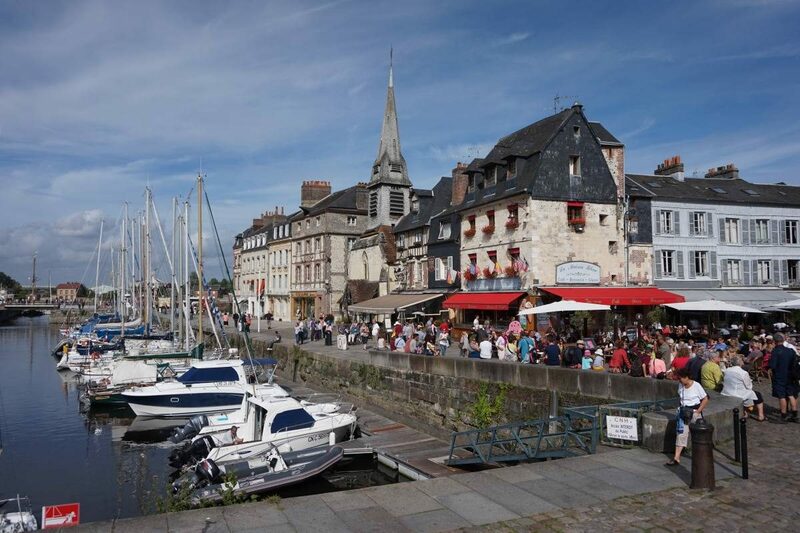 If you decide to visit Mont St Michel with the same tour company I did, then you’re also going to see a charming town of Honfleur. With 16th-century country houses and cobblestone streets, this place has a charming character despite the high number of tourists. It’s a great spot to spend an afternoon. 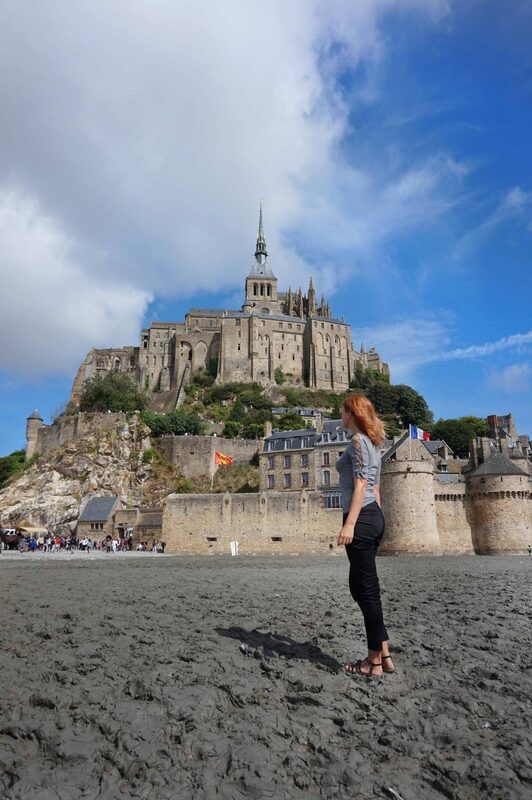 Visiting Mont Saint Michel from Paris can either be a dream come true or a nightmare, as the place is tiny and crowded. But my trip to this medieval castle and city was absolutely magical thanks to Normandy Melody.